September 30th, 2015: Fix to tdpure.txt in xorules.zip. No released maps affected. September 19th: XV-Czech Mate map updated to v2.1 and xv.txt in xorules.zip was updated two days ago. Sep. 15th: Now hosted by C&C Guild on Revora.net. Almost all XO maps updated to v2.0 and added page of XO mod-maps for Red Dawn! Sep. 3rd: Added: XV: Crossed up Vehicles map-mod. RA Online works just fine. If playing offline, remember to use RA1MPLauncher.exe to play skirmish with CNCNet's spawn1.mix loaded for the C&C1 gfx. 4 different playable teams! More like 6 with varied GDI's and Nods! France and Greece still Allies. Russia and Ukraine still Soviet. England = GDI with GPS and Chronosphere. Spain = GDI with Iron Curtain and Airfield. Germany = Nod with GPS and Chronosphere. Turkey = Nod with Iron Curtain and Airfield. There are also rule sets with my XO combined with Counterstrike's Lunar Battle Field map's rules. 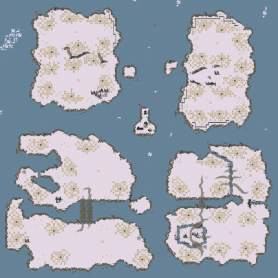 Download various xo rules to paste into your own maps. You can also take rules from any of my maps or ask if you want anything custom tailored. Almost every map features custom paradrop. Rules sometimes vary from map to map. 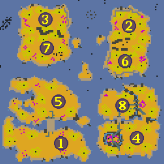 Chronosphere doesn't kill passengers in Arena Valley, Treasure Isle, or Lunar maps. No tanks, but all other vehicles and infantry. Vehicles have their exact stats and graphics close as possible to C&C1:Tiberium Dawn and Red Alert 1. Nod Artillery is even different from Allies. GDI APC has different firing rate than Allies and so on. Nod has their SSM while Soviets have their V2. Team games should be interesting. Aug. 12th: Released XV-Czech Mate on cncnet.org's RA multimaps forum. No chance of stealth crates and subs are only stealth units so you don't have to worry about people hiding stuff with short game off. 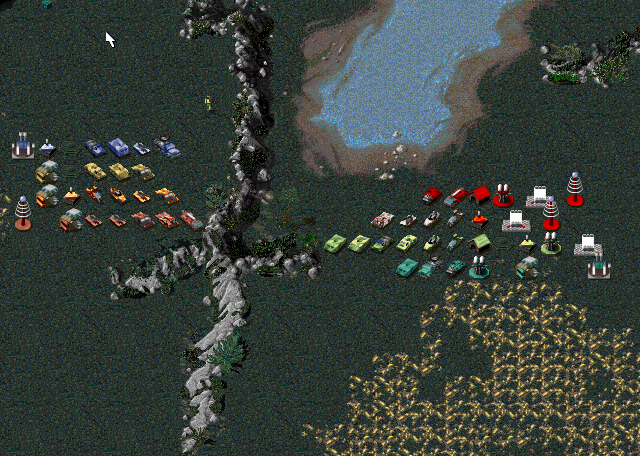 All get airfield, Grenadiers, Mechanic, Thief, Spy, Tanya, Commando, Dogs, Mine Layer, Missile Silo. 4 factions get demo truck. 5 factions get Allied barracks and 4 factions get Soviet barracks (LoTeks have both). 5 teams get Ship Yard and 4 get Sub Pen (Long Arm gets both), but they require dome. 5 teams get gap generator. All get fake structures but no fake naval structs. 5 get GPS (and not all the same five that get Gap Gen). 6 get Chronosphere which doesn't kill passengers and 2 get Iron Curtain. Most vehicles require nothing extra or just dome. Chrono Tank and Phase Transport merged into one unit that only Special Ops gets. Chronoshifts instead of cloaking, but passenger can only get out of it by vehicle being destroyed. Animation comparing original map to offcolor RA recreation. Click for view of most of army. This is a recreation of a map by the same name from WCII. Since it's based on XO rules it requires CNCNet's spawn1.mix which contains C&C1 gfx. Use RA1MPLauncher to launch skirmish mode. Or go to play online but instead of logging in, choose skirmish there. Choose any #start but 2. And for an AI opponent set it to start #2. Set any additional AI players as your allies at other starts. You can play with bases on or off, as they are already provided for you and the enemy AI. You start with a ton of Nod units and some other units. No one has GPS, spyplane, or paratroopers, except maybe your AI opponent. Gun Turrets and Chem Warriors are changed to be able to shoot over concrete walls. Oil Pumps generate power and store ore. I brought in a couple ideas from Lunar Battle Field rules. This is the only map I have ever made with infinite ore. It was necessary to recreate the contained gold mines. 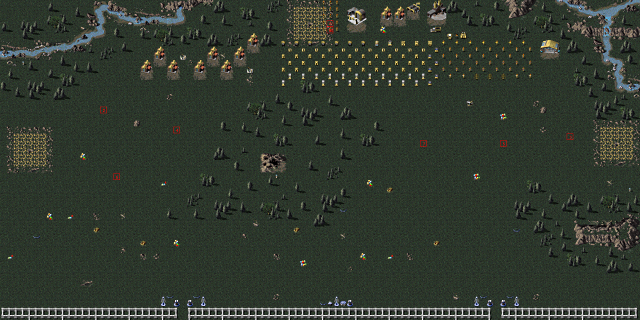 Each player start is now surrounded by equal amounts of ore, gems, and mines. Great Video of Paraships and other custom paradrop possibilies. To drop paraships, target the water against landable beach. RA normally has a cap of 500 land vehicles and 100 sea vessels. In these rules it has been changed to 300 and 300 but currently CNCNet ignores those changes. 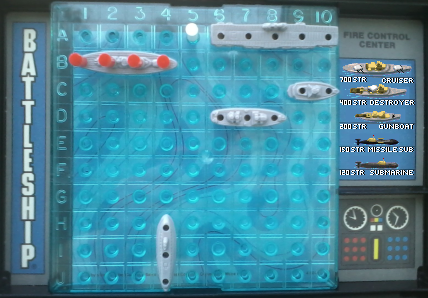 In order to bypass the 100 cap, these maps feature ParaShips and there are also automatic reinforcements of transport ships containing units that travel to the center of the map unless you grab control of them sooner. In this Lunar map, firing rate and groundspeed are normal, and GDI(Eng&Spain)'s selection of units/defenses is like Dune. In Thawed Shards of Luna I experienced one mysterious crash in an 8 player game sometime after the 100 vessel cap. Saving and loading in skirmish mode is not recommended, but here is a funny glitch video. Many pieces of the already existing concrete walls have been deleted leaving just corners to not cramp players so much. In this Lunar map, firing rate is normal, some units are slower but still faster than regular Lunar, and GDI(Eng&Spain)'s selection of units/defenses is like Dune. 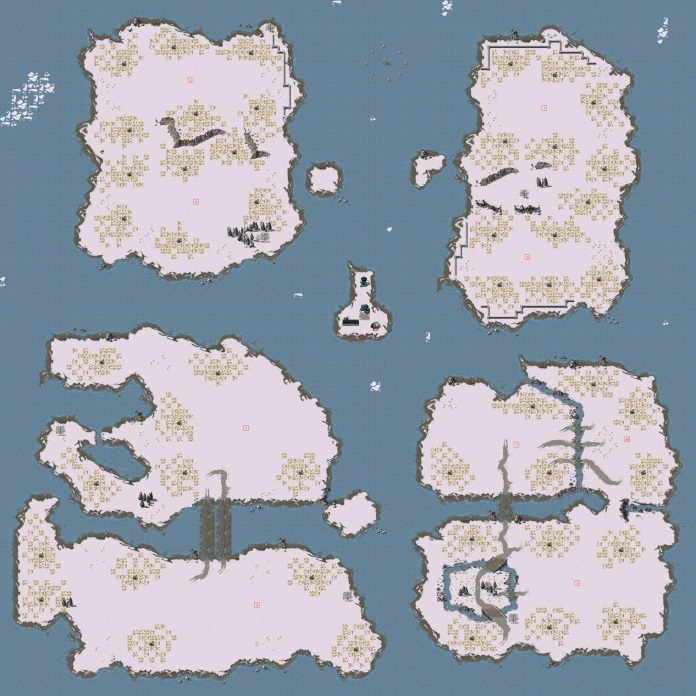 This map is the result of copy&pasting together Zelda's Death Mountain, Volkov Deathmatch, and part of an older version of Cape Town expanded into one big XO map with additional work done on it. Careful what computer things you attack... Plenty stuff to explore and attack or capture but you might get wrecked by other players if you focus too much on it in multiplayer. 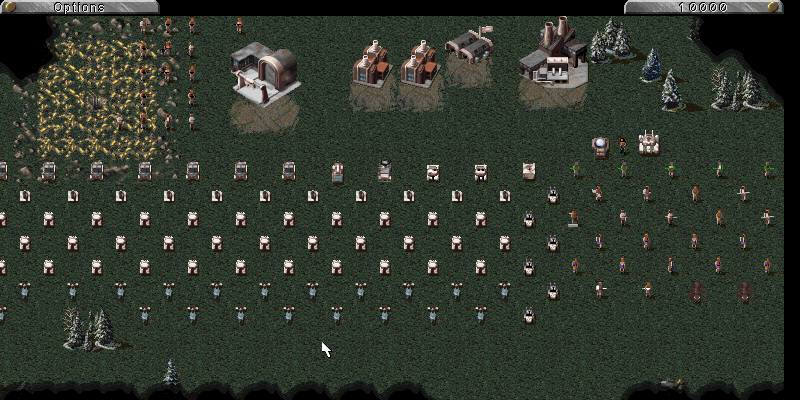 This map is designed for play with bases off and unit count 0. You start with a squad and two Chinook transports fly out to you. This map is designed for play with bases off, crates on, unit count 1, and as many other players and AI players as possible. 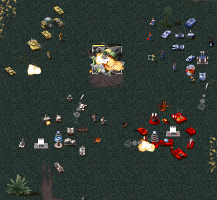 You are a super soldier and must face off against others including heroes or anti-heroes of Red Alert. 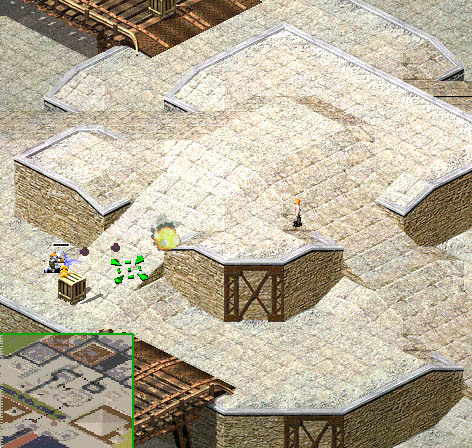 This map is designed for play with short game off, crates on, unit count 1, and as many other players and AI players as possible. Select your character and fight all others to the death. Soviet super soldier Volkov and his cybernetic dog, Chitzkoi, await opponents. But there is a greater threat and a few surprises. These are various .ini files you can edit and have the modified file sitting in your game directory. All .ini files are plain text editable with notepad. .Eng and .CSF are text string data files that require special editors. Changes you make in rules.ini, aftermth.ini, mplayer.ini, firestrm.ini, rulesmd.ini can be copy and pasted into map files for whatever game they're for so you have your affects in just your map rather than the whole game. In RA1 maps, your rules changes must come before the [digest section or you can delete the [digest section. In Nyerguds's latest update of C&C you can edit themes.ini and here are tons of .ini files of original C&C settings though only that one is currently implemented for the game to recognize. RA uses a different scale for speed than C&C TD. but I think RA's unfortunately not as fine scale is somewhere from 0.4 to 1/3 of C&C's. This is further complicated by RA's different settings of units' % of full speed per terrain type. In C&C a speed 30 wheeled vehicle goes faster than a speed 35 tracked one on regular terrain. In RA a speed 10 wheeled vehicle goes slower than a speed 8 tracked one on regular terrain. Here is a list of hopefully accurate speed tests done by me. Update: For best solution see my XO rules in which I left Ranger at speed 10 but changed wheeled vehicle speed from 60% to 90% for regular clear terrain. Here is a fixed mission that was broken in the v3.03 update. Or you can do practically whatever you want with my XO/XO Lunar/XV rules to paste into your maps or copy&paste them from my maps. You can modify them to your liking. Maybe want to use the rules.ini in the patch subfolder of the zip, but not sure if that's TS or TSFS rules. Firestorm has some bad changes such as making artillery almost uselessly inaccurate. Maybe customize rules to revert to regular TS but with FS's new units. I did not mix up TS files with RA2. Some RA2 files actually say Tiberian Sun in them. Generals and Zero Hour have all their ini files organized into an ini.big file you can extract them from instead of scattered throughout many .mix files. I don't yet know where C&C3 and RA3 have their rules settings. CnCNet - Classic C&C Online Forever! 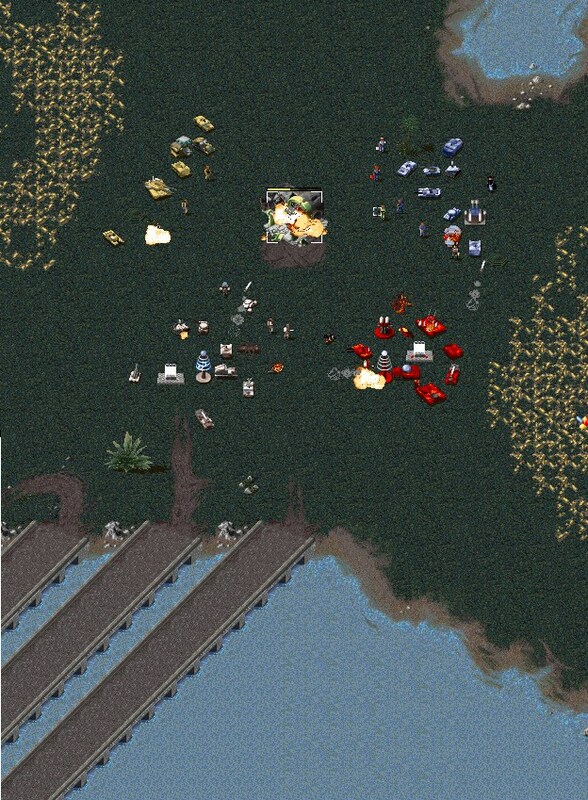 Red Dawn - RA1 modified into C&C1 with a ton of missions from both playable! Dawn of the Tiberium Age - Tiberian Sun modded into C&C1+RA1 with a bunch of missions... Amazing! their mod page - where you can find Armageddon 4 and Project Revolution v1.5 which I did voices for. P.O.W.W.O.W. (Pain of Wisdom in a World of Waste) - peaceful revolution through agriculture. StopTheThyroidMadness.com - Get informed before you let the medical cartel ruin your life or anyone's life. *. I assume no responsibility for the accuracy of this quote.